The March 2010 issue of Informa Law's Copyright World has now been published. 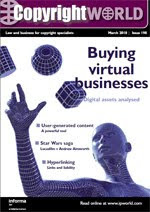 This issue is of particular interest to readers of this weblog since it contains two articles on transactions involving virtual assets. In "Buying Virtual Assets", a short piece by Rob Hawley, a partner at Mathys & Squire, the challenges of buying virtual assets are examined in light of the purchase earlier this year of the Crystal Palace space station -- an asset which exists only within the context of the MMORPG Planet Calypso. Also, in the somewhat longer “Virtual Worlds, Real Risks, Real Money” Linklaters’ Christian W. Liedtke discusses both the business benefits and the legal framework of user-generated online content. Further details of this issue can be seen here. Can There Be Too Much IP Within the Organization? How much is the use of "Lindsay" worth? Does download dip denote disaster?